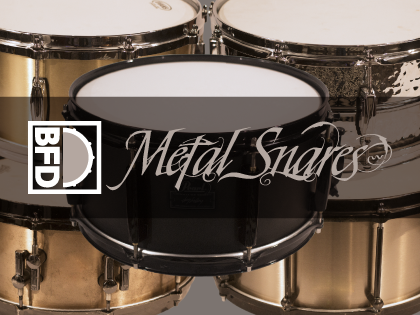 BFD Metal Snares is a collection of premium metal-shell snare drums for BFD3. Metal shells are desired for their brighter, louder sound with increased overtones. We've chosen five snares with different materials, shell thickness, depth, and diameter, so you'll get a wide array of sounds. They were then meticulously captured with wires on and off and delivered in natural and processed versions. 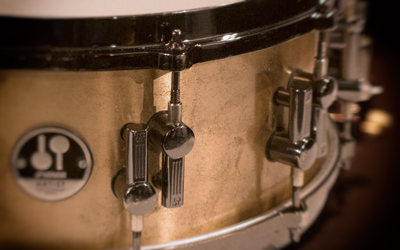 These snares are mix-ready, inspiring, and ideal for your next project. Each snare drum was recorded with 2 top mics, 1 bottom mic and 1 side mic, along with mono room, ribbon room, and far room ambience channels. We added 2 stereo reverb channels to achieve a massive sound. From Brass to Bronze, Steel to Aluminum, these metal drums are full of character offering huge sounds that punch through the mix. Manipulate the natural recordings to your liking and dial in the room - or choose a processed, mix-ready version - then add other drums from your BFD libraries to create your ultimate kit. Experience the impact and unique character of metal shells with BFD Metal Snares.